iDancehallReggae.com::Caribbean Lifestyle Media::: Negril: INK "Tropical Magic"
With a record breaking turn out in patron attendance INK The Xclusive Tattoo & Body Piercing Beach Party, held on Sunday April 12 2008 at Chances Negril was voted the best event of the Negril's Easter Weekend. The event played host to some of the island's most exclusive and glamorous patrons, including party host fashion designer and style connoisseur Mr. Dexter 3D Pottinger. Also on hand was the "always stunning" socialite Latonya Firstclass of First Class Dancers. Zj Elektra, Heineken Green Synergy Champion Dj Slim and Kaotic that turn out the musical selection. The venue draped in breathtaking decor, two fully equipped private and professional tattoo & body piercing booths, a fully stocked bar of your favourite liquors and spirits, transformed Chances into the ultimate party haven. Diageo's Red Stripe was on hand and allowed our world class bartenders to serve up some of the finest premium brews and mixologies. As expected INK was an instant hit. The event was one that showcased the fantastic synergy between, exquisite gourmet food premium drinks, good friends and music. The synergy, coupled with an elite array of the most illustrious patrons in attendance, allowed INK to emerge as the most appealing event of Negril's Easter weekend. It is on the success of our most recent event that we take great pleasure in inviting you, our loyal patrons to share in our next staging of the event series titled "INK" Tropical Magic" More Wet More Wild, the grand finale of the ATI Lead Up Series on August 1 Emancipation Day, at Chances Negril. For this staging Tovan Haye's Skylab Events, Alex Chin's Absolute Entertainment and Appleton have banded together to give patrons another "Magical" Experience on Emancipation Weekend Saturday Aug 1 before the big ATI weekend. The event will seek to duplicate the same exhilarating experience for our patrons as the series before but with the addition of a new attraction that only see unless you come to INK. 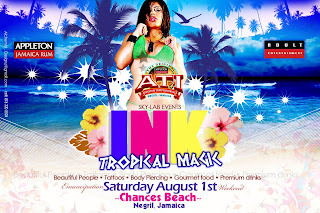 Come Aug 1 INK will be the last place for patrons to win an ATI season band before the big weekend four days later, complimentary body piercings, tattoos, good food, funky fresh music, premium Appleton mixes and a barrage of pure unadulterated fun and excitement as we dare to take you to the far edge of wet & wild and back, with INK "Tropical Magic"
Ladies get that hot Summer body ready and come get INK'd for ATI ! ● INK "Tropical Magic" The Xclusive Tattoo & Body Piercing Beach Party. ● On the pristine white sandy beaches of Chances Negril. .Facials and hair care samples. INK "Tropical Magic Package" Giveaways For the Ladies. Lucky female patrons gets a chance to win gift packages by purchasing pre-sold tickets from any ticket outlet. Ladies in swimwear FREE before 2pm. ● Hutchinson Texaco Sav-la-mar ! Ladies Come Experience The Magic !!! INK "Tropical Magic" was officially launched at the ATI press party held at Carlos Cafe in Kgn. The Absolute Entertainment staged event played host to a slew of corporate sponsors, local and international celebrities alike.